With December just around the corner, we're rapidly approaching the pantomime season once again. I'm already in rehearsals for Broadclyst Theatre Group's production of Snow White and the Seven Dwarfs, which you'll hear more about in due course. But today, I'd like to draw my more northern viewers' attention to the efforts of Warkworth Drama Group, whom I posted about this time last year. 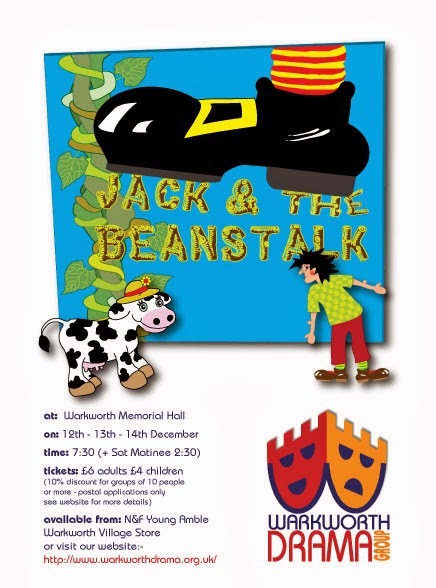 Following their successful production of Mother Goose last December, Warkworth Drama Group are back in full force this year with Jack & the Beanstalk. It's the classic tale of the poor farmer's son who climbs a magic beanstalk in search of treasure to feed his starving mother - and meets an angry giant on the way. Having been part of Warkworth panto's before (the hero in Goldilocks and the villain in Sleeping Beauty), I can safely say you're in for an amazing show with fun for all the family. Jack and the Beanstalk is playing at the Warkworth Memorial Hall on Castle Street, Warkworth from Thursday 12th to Saturday 14th December, with performances at 7:30pm every evening and a Saturday matinee at 2:30pm. Tickets are £6 for adults and £4 for children, and are available from Warkworth Post Office, N&F Young's in Amble or from the website here. Good luck to all the cast and crew, who take to the stage in just under a fortnight. Break a leg! P.S. Check out my review of Fun & Fancy Free here for my thoughts on Disney's take on Jack & the Beanstalk.